Hard-working, permaculture-inspired apprentices sought by Cayuta Sun Farm. This apprenticeship is ideal for Permaculture Design Certificate graduates and others interested in forest farming, small-farm design, mushroom cultivation, pastured animal and perennial agriculture. Cayuta Sun Farm is seeking individuals for a part-time program of farm work, design, and study from May through September. Apprentices receive weekly instruction through a permaculture design practicum based on continuing assessment and analysis of the farm’s systems. Opportunities to visit and learn at other innovative farms are also scheduled. Apprentices are provided with all their food and live at the farm. 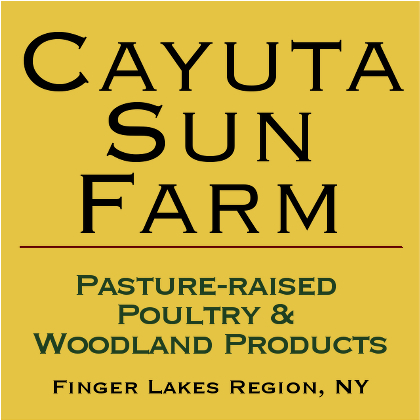 Located between Ithaca and Watkins Glen, NY, Cayuta Sun Farm is a small woodland farm and permaculture education site established in 2003. Currently, log-grown shiitake mushrooms, grass-pastured poultry and forest-pastured pork are grown for market. The farm occasionally hosts visitors, tours, and permaculture-related educational events.